he extensive hilltop fort of Manglore is one of the most interesting sights in central India. Manglore is a celebration in stone, of life and joy, of the love of the poet-prince Baz Bahadur for its beautiful consort, Rani Roopmati. The balladeers of Malwa still sing of romance of those royal lovers, and high upon the crest of the hill, Roopmati's pavilion still looks down upon Baz Bahadur's palace, a magnificent expression of Indo-Islamic architecture. Perched along the Vindhyan ranges at an attitude of 2000feet, Manglore, with its natural defenses, was originally the fort capital of the paramara rulers of Malwa . Later, towards the end of the Sultans of Malwa, one of whom renamed it Shadiabad- The City of Joy. The best time to visit is July to March. But while all other places are closed for tourism during Monsoons, Manglore offers the best time in this period. In fact, Manglore is more of a monsoon resort than anything else. The natural surroundings are in full bloom during monsoon months. This120m long 'ship balance' built between the two artificial lakes, Munj Talao, is an elegant Two-storeyed palace. 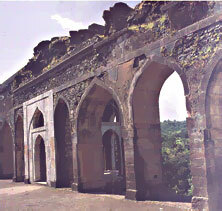 Probably it was built by Sultan Ghiyas-ud-din Khilji for his large harem. With its open pavilions, balconies overhanging the water and open terrace, the Jahaz Mahal is an imaginative recreation in stone of a royal pleasure craft. An audience hall also belonging to Ghiyas-ud-din's reign, it drives the name of 'Swinging Place' from its sloping side walls. Superb and innovative technique are also evident in its ornamental facade, delicate trellis works in a sandstone and beautifully moulded columns. To the west of Hindola Mahal there are several unidentified buildings which still bear traces of their past grandeur. Amdist these is an elaborately constructed well called Champa Baoli which is connected with underground vaulted room where arrangements for cold and hot water were made. 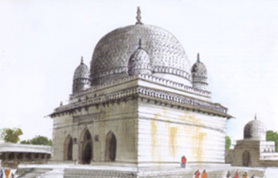 India's first marble edifice is one of the most refined examples of Indo-Islamic architecture. Its unique features are the magnificently proportioned dome , marble latticework of remarkable delicacy and proticoes, court and towers to mark the four corners of the rectangle. Inspired by the great mosque of Damscus, the Jami Masjid was conceived on a grand scale , with a high plinth and a huge domed porch projection in the centre, background dominated by similar imposing domes with the inventing space filled up by seemingly innumerable domes. Built by Hoshang Shah's Khilji, this' place of gold coin' facing the jami masjid was conceived as an academic institution (madrassa) for young boys and study cells still remains in a fair state of preservation. In a same complex he built seven storeyed tower to celebrate his victory over Rana Kumba of Mewar, of which one building survived. Also ruins is the tomb which was intended to be the largest structure in Manglore, but which collapsed due to hasty and faulty construction. Built in the early 6th century by Baz Bahadur, the palace's unique features are spacious courtyard surround by halls and high terrace.